The New York Times reported in the Metro section on May 31 about strip clubs under fire (sounds like it belongs in the Post, no?). As anyone who has traversed 2nd Avenue from Gowanus to Sunset Park can tell you, the auto body shops down there share company with more than a few strip clubs. The New York Times reports that neighbors and the City have tried to shut down the Sweet Cherry, at 42nd St and Second Ave, but have not succeeded as of yet. Yep. I'm having a show starting this upcoming weekend in Providence. At, aptly enough, the Brooklyn Coffee & Tea House. It's on Smith Hill, at 209 Douglas Ave. I'm showing a set of photos from my building reflection series, which are dreamscapes of New York brownstones, and a few pieces that are more abstract and modernist. I'm very excited to be able to show in what is basically my hometown, and for all of my extended family in the area to be able to come. I brought all the pieces home this past weekend in my duffle bag and laid out the show on my parents' dining room table. They're going to help me out and hang the show for me since I won't be back up in Providence until the opening - thanks, mom & dad! 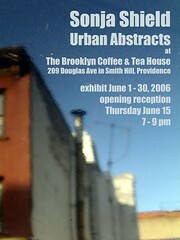 Which, speaking of the opening, is Thursday June 15, from 7pm to 9pm. If anyone is reading this, y'all should come. A few months ago, all four of us kids happened to be back at my parents' house in Seekonk, MA (a difficult thing to coordinate!). Over the dinner table, we started talking about how many people in our town had gotten cancer. It seemed like A LOT. As we threw out names, it struck us that a lot of them lived in the North End, many in particular neighborhoods. We started to wonder whether they got sick because of where they lived. Could there be something in the town's water supply, or some environmental hazard in particular neighborhoods? Were there any patterns? Now I had a bug in my ear about it. I started looking into public databases to see what I could find. It turns out there's a lot of information out there -- reports of oil spills, other contaminants, leaking underground storage tanks, etc. 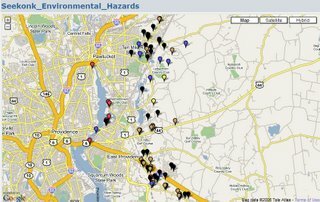 I entered the info into a Google mash-up called Map Builder and voila - a visual representation of the various environmental hazards in Seekonk and some of the neighboring communities. The next step would be to compare this map against a map of where people who have gotten cancer live, grew up, or work. I haven't done this yet. I'm concerned about people's privacy, and haven't figured out yet how to put that information into a map without violating their privacy. Also, I obviously don't know everyone in town, and I don't want my map to falsely represent the incidence and occurrence of cancer. Any comments, suggestions, or information are encouraged and welcomed. If you are reading this, welcome. The way I figure it, this blog will probably end up serving as a combination photoblog and repository for my experiments in mapping and historical research. I live in Gowanus, Brooklyn, and am avidly watching and documenting the changes happening in the neighborhood. I have a lot of mini projects that may be able to find a home here. In the meanwhile, for more photos, check out my flickr site.